piping diagrams except they use electrical symbols instead of piping symbols. Figure 1-8 is an example of an electrical system schematic. Schematic diagrams are especially helpful when you are learning a hydraulic system or pinpointing a malfunction in an electrical system. For more information on diagrams, drawings, and blueprints, and their interpretation, study Blueprint Reading and Sketching, NAVEDTRA 12014. REVIEW QUESTION Q6. Where is the title block located on all blueprints and drawings prepared to military standards? METAL-CUTTING TOOLS LEARNING OBJECTIVES: Identify the different types of metal-cutting tools. Describe the uses of different types of cutting tools. Many types of metal-cutting tools are used by skilled mechanics of all ratings. As you become better acquainted with the ABE rating, you will probably discover many tools that you use for cutting metal that are not described in this text. In this text, only the basic hand metal-cutting tools will be considered. SNIPS AND SHEARS Snips and shears are used for cutting sheet metal and steel of various thickness and shapes. Normally, the heavier or thicker materials are cut by shears. One of the handiest tools for cutting light (up to 1/16-inch thick) sheet metal is the hand snip (tip snips). The STRAIGHT HAND SNIPS, shown in figure 1-9, 1-9 Figure 1-8.Electrical system schematic. 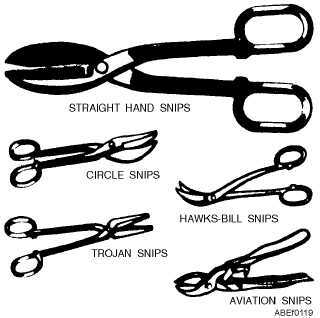 Figure 1-9.Metal snips.